What kind of business will prove profitable in the long run? This guide will help you filter the options to a model that is most likely to succeed. Choose the right business model with this practical checklist. Lifetime customers equal lifetime profit. [Click To Tweet]. Pick the middle price point and go up from there. [Click To Tweet]. The ideal market gives your business room to grow. [Click To Tweet]. All it takes is a starving crowd. [Click To Tweet]. The bigger the problem, the better the solution will appear. [Click To Tweet]. James Schramko here, filming from Hawaii where I’ve been doing a business retreat for our podcast, ThinkActGet which Ezra Firestone and I do. In this episode, I’m going to talk about the ways that you can filter for a potential business idea. So we’ve sat down with a few business owners and each one of them wanted to start a new venture. So I pulled out my project stream which is a systematic checklist of taking an idea from start to finish, and we get up to the business model part and that’s where I have a set of filters that helps me determine what sort of business I want to go into. So we went through that checklist and I thought you might really enjoy finding out the things that I would look for in a business, and perhaps you might have some of these in your business. So let’s go through the list and see how your business stacks up. The first one I look for is a lifetime customer model. This is where you get one customer and you keep being able to service them for a long time. This is more profitable, it’s much easier and you actually don’t have to focus all of your efforts on customer acquisition or customer traction, or paid traffic, or conversions. Once you have that customer, you can focus on the customer and looking after that customer and keeping that customer for a long time. That customer, when they’re happy, will actually bring other customers and continue to purchase. So that’s the first filter: the lifetime customer. The other thing I look for is the long-term commitment. Are you interested enough in this and are you expert enough in this to be able to surround yourself with the information you need to serve this market? That means you may want to go to events. You may read trade journals. You may follow blogs. You might listen to podcasts. You have to be able to have that conversation with the customer for a long time. When I was in the automotive trade with BMW and Mercedes-Benz, I did that from 1995 through past to about 2006. That’s a long time in one market, over a decade, and you have to be able to have that conversation over and over and over again. So surround yourself into a market that is something you’re happy to talk about and happy to stay up with. Look for the right price points. If you go into a very low price point, or very low margin business, you can expect very aggressive competition and people will come and go from that market as they go out of business. I like the selected intermediate to advanced pricing level because you automatically have different customers. You have enough margin to have a great business and there’s less people in that market. Almost everyone is scared to compete in that mid- to high-priced point level. And you’ll find this really good customer. A lot less people serving that customer and it’s easy to stand out. Again I draw back to my BMW and Mercedes-Benz experience and it was much more pleasurable than having high-volume, high-churned, low-commoditized price point. So whether to product or service, pick the middle if you can and go up from there. The next thing is scale. Do you actually have enough audience that you can grow this and still have a business? I’ve made the classic mistake of niching down too small and running out of audience. You could be the biggest fish in the pond, but if your pond is a goldfish, then that’s kind of limited. So pick a big enough market that you can enter into and specialize or niche to the right part of the market that allows you the growth. Because you’re going to be confident, because you’re going to be following these sort of tips that I put on SuperFastBusiness, you will be able to grow into a bigger fish and you’ll grow into a bigger pond if your pond’s a little bit bigger to start with. So don’t go micro super niche just because it’s easy and because you get a fast start. You will run out of growth and you’ll have to start again. The next one is capacity to supply. You have to be able to actually supply the market. There’s no point going into your business model if you can’t actually find a source of supply. Whether that’s you, whether it’s a team, whether it’s an external supply, you need to be able to find supply. And I see a lot of people running into this mistake. They think they’re going to go into a business, they set their prices low and they’re either doing the work themselves, in which case they run out of capacity because you only got 180 hours per month; or they get a small team and they just can’t keep up with supply and they find it too hard to attract and recruit a very small team and keep them sustained. So go and look for quality supplies. Again if you look at Mercedes-Benz, they get supply from Michelin and Bridgestone and Pirelli and that gives them enough ability to continue manufacturing cars because there’s plenty of tire supplies. Make sure that your business solves a problem. If your business doesn’t solve a problem and if there isn’t an audience of people out there who have that problem, then it’s going to be a tough job. So start with the audience if you possibly can. As the great Gary Halbert used to say, give him just the starving crowd, that’s all it needs. So start with the audience who has a problem that you can actually solve and look for a large market of people with huge problems. The bigger the problem, the better the solution will appeal to them. You want to make sure that you can reach the customers. You have to be able to access these people easily whether that’s Facebook, newspaper, radio, communities, forums, live events, you’ve got to be able to easily access these people with problems. 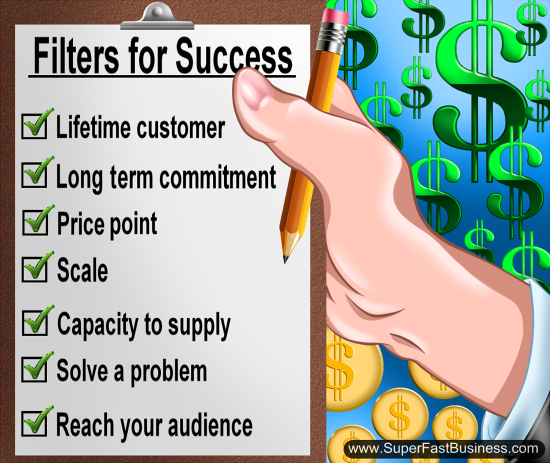 So, now if you have some of these filters in place, you should have a pretty decent business model that is going to do what you need it to do. And I’m sure, as this has worked for me and many of my students, it’s also going to work for you. What I’d really like you to do is ask your questions right near this video or comment below this video if any of these have resonated with you. Perhaps you made a mistake with one of these filters and it’s cost you dearly like it has with me. Perhaps you’ve nailed it, you have it right and you have a fantastic business. Tell me about it, right near this video. I’m James Schramko coming to you from Hawaii. I’ll catch up with you soon. Thanks James, this was *very* clarifying! I’m happy to say I meet each of the criteria with my biz (I have a meditation school), but am working a bit on the supply aspect. The source of supply is “me” and I’m now realizing that creating and selling products (audio downloads, video courses, ebooks, etc.) will be a great focus and help with supplying my customers better and freeing me up too. Hi Leanne, start by solving your own problems. What services, subscriptions, products do you already consume or would like to consume? Hi James,this video not working at all for me on an iPhone today..
James, G’day from Wilmington, DE on the east coast. Hope your trip so far here in the US is an enjoyable one. Thanks for the great, great tips above: all solid stuff. 1. Lifetime income. Recurring income in the niche I’ve selected gets generated through a membership site that’s part paid forum and part authority magazine model. This will provide value for the lifetime of the customer. I’m splitting content visibility on an 80/20 ratio, with 20 percent of the stuff free and open to all, with the remainder sitting inside a member only area. 2. Long term commitment. I’ve been creating content in my chosen niche for four years; I retain the copyright to everything I’ve contributed. I set out to position myself as an authority within this niche in 2009. That effort is paying off because in my own way I’m now viewed as a presence worth taking notice of. 3. Price point. From all the research I’ve done the access points that offers the best return on effort lie between the $39 and $79 per month slots, with upsets and affiliate offers slotted in on an 80/20 ratio (there’s that number again) against solid content. This price range weeds out the tyre kickers and freebie seekers while creating enough leverage to prevent me from working for $2 per hour (which is not good!). 4. Scale. This is where things get interesting. The pond is large, I’m a growing fish, and there’s scope for steady growth (Google Trends shows choppy though steadily upward growth in this niche dating back to 2008 in tow major geographic regions). 5. Capacity. Since 2009 I’ve created over 1,000,000 words of content in a host of sub niches within my main niche. I see this as my reserve library. I’ve got 50 magazine-style articles that are pretty much ready to go in one niche, with another 20 articles in a second niche (which uses a slightly different business model). 6. Problem solving. The research I’ve done and the visibility I’ve created sets me aside as someone who cuts through to the solution. The audience has questions, I have answers. A modest monthly membership fee glues the two together. a wee experiment on audience attraction and retention. The results (and the strategy behind the plan) have proved I can build a presence within a niche that attracts attention, which in turn, attracts other attention. I’ve built up a solid following of just over 3,400 people and companies, which has grown without paid promotion. I’m currently building a clutch of small test sites and social media streams to probe the waters for audience (and therefore market and income) viability. No sense in rolling out the big guns until there’s something to shoot at. What do you think? 1. just do the forum forget the magazine part. Put your free content on an authority blog. I tried the magazine and had very little traction competitor superfast business.com. 7. forget that part. Twitter is fluff and noise. Forget rolling out test site (s). Just make your master blog now. Holy smokes, James! THANK YOU! Thank you so very much. Greatly appreciated. This short video may be one of your most powerful and useful. As I’m trying to restructure my business right now this is super important and I’m so grateful for this blueprint. Thanks James – you never disappoint! Each person have strong point in some field of life, so each of us should choose a suitable business model to do. Doing business is not easy at all. We sometimes have to accept risks, but if we are determined, we can be successful one day.